Yet the oil reality still does not inform sufficiently to change society's course, nor does the end of cheap, easy petroleum appear to terminate growth -- just yet. The stock market already has jitters as it crests another all-time high. Last week the Fed tried to shore up confidence by announcing that interest rates will presently be adjusting upwards. Any announcement by the Fed immediately clobbers gold prices, but the dollar index has been coming down for 7 weeks as international treasury-bond holders, like the EU and China, worry about how long the charade of solvency of the US empire can continue to extend and pretend. The Fed’s announcement seems to say, “not much longer.” Janet Yellen’s statement was less to reassure foreign markets than alert her bankster billionaire pirate buddies that the bonus treasure chests will soon be used up and its time to shift any remaining loot to their Cayman Islands accounts. The pace of crisis or collapse is hotly debated. Jeremy Rifkin has a new book, The Zero Marginal Cost Society: The Internet of Things, The Collaborative Economy and the Collapse of Capitalism that postulates a very Marxian withering away of the state, and vulture capital, owing to the rise of The Makers. But all of that Maker World — 3D printers, neighborhood tinker camps, garage start-ups — relies on access to (cheap) electricity and the internet. Rifkin thinks distributed generation will supplant the central power station paradigm, but in our view, the timing is critical. Can extend-and-pretend conceivably stick around that long? That the future will be like the past, only better. That economic growth will continue and solve all our problems. That a rising tide lifts all boats. That the best way to ensure prosperity is to cater to the needs of the wealthy so that the trickle-down effect will produce widespread prosperity. That unregulated "free trade" benefits everyone and is always a good idea. That we just need more technological innovation to get the economy moving again. That there will always be enough jobs to go around for everyone. That government interference in the economy is always a bad idea and that "free market solutions" are best. That anyone can be rich if only they work hard enough. That poverty is always simply the result of individual failure, and that government help encourages dependency and sloth. That our societies are on a path of never-ending progress. [T]he media does not exist to inform or further the debate. It exists to limit the terms of the debate, to enforce the existing status quo, to legitimize the existing social arrangements and institutions, and to provide a convenient distraction for the masses. It is designed to maximize profits and is dependent upon funds from advertisers, and the last thing advertisers want is people asking inconvenient questions (especially about the economy or consumerism). The thing is, we actually know what must be done to save our planet, and it is not the propping up of a consumer society. Hill lists a few of the tools we already have — new economics; ecological restoration; degrowth with happiness indices; permaculture and carbon farming/regrarianism — and doubtless many more tools will emerge as we embrace the change. We need to garden the planet. We need to be nice to each other. It is that simple. We have been re-reading and recommending David Korowicz’s classic FEASTA paper, Trade-Off, as one of the best pieces ever written to explain the market mechanics. The outshoot of all of this is that while it might be nice to imagine a re-run of the crisis of 2008, and to prepare for that, it is a bit like planning for the last war. 2008 cannot be repeated for the simple reason that by adopting “extend and pretend” instead of real economic reform, the Seneca Cliff was pushed much higher and the Olduvai Gorge much deeper. Case in point. The total world debt in 2008 was said at the time to be 67 trillion. That debt represented excess claims on underlying real wealth (nature, including human social capital). Some of the extant derivative instruments took hits in 2008, but it was short lived, and even greater derivative fraud has been the rule for the past 5 years. We just passed 100 trillion for current total debt, a growth rate of 50% in 5 years or a doubling time of slightly less than 10 years (approx. 7% annually). So world debt, on present trajectory, would be double that of 2008, or 134 trillion, by 2018. If that could actually happen, by 2018 we will have added more debt in 10 years than all the debt previously run up in the history of economics. But it is all fraud. There is nothing to back that debt. It exists solely on the illusion that it represents reality. Reality: it is ones and zeros in the cybersphere. It is literally a confidence game. Second case in point. In 2008 there were things that the Fed, the Treasury and the White House could do to boost liquidity and stimulate the global economy. They passed out billion-dollar checks to billionaires. Where did that money come from? Treasury Bill auctions. Who bought those T-bills? China, Japan, the Caribbean tax-free banks, the Saudis, even the Russians. So what is happening now? T-bill auctions are hard sells. Russia moved its T-bills out of NY banks as Crimea began to escalate and may well liquidate them, soon, flooding the market. China continues to unload 100 billion of its 1.2 trillion in T-bill holdings every few months. Where would the US get cash for a second great bail-out? More Imagineering? If the escalation over Crimea, or the next big market crash, were to crash T-bills, it could bring about a sovereign default of the United States. That seems isolated until you look at how many things are indexed to the dollar. So people stop taking dollars for things of value, but they also have to stop taking most other currencies, too. Commerce grinds to a quick halt. No one can pay their bills. The ramifications and ripple effects — troops stationed overseas with no contractors to supply them; vacationers stranded at DisneyWorld, Vail or Acapulco; millions ravaged by freezing weather, famine and epidemic disease — become, in a matter of days and weeks, scenes of zombies, living on the flesh of the recent dead and whatever edible grasses and roots might be gnawed to stave off incessant hunger. Note: the scenes are not of Okie camps in the Dust Bowl, or breadlines in the Depression. There are simply no remaining pockets of wealth, no green shoots from which to revive an economy, and, absent electricity, fuel and currency, no convening government authorities to coordinate relief. Complimentary currencies could continue functioning to augment barter, but they are only miniscule in the big picture. If money suddenly becomes worthless most places, the economy “locks up,” meaning that government offices close and utilities that are privately owned shut down. This is what is termed in doomer circles, the Korowicz Crunch. Milk will be dumped in ditches because it can’t be transported from the dairies because there is no petrol because the filling stations have closed from a lack of electricity. In the US, the only two federally owned electric utilities would (hopefully) be tasked with providing enough emergency power to bring the 100 US nuclear plants to cold shutdown (a many-years' long process of water circulation using enormous electric-powered pumps), averting 100 Fukushimas, and perhaps supply some spare power to the emergency meetings in various state capitals, or hospitals and National Guard bases. We mention the National Guard, because it would be needed to transport coal to those two federal utilities, Bonneville Power Administration (BPA) and Tennessee Valley Authority (TVA), assuming they were nimble enough to recognize the peril at Indian Point and the other 99 ticking atomic time-bombs. BPA’s 31 hydroelectric dams on the Columbia River and a nuclear plant located at the Hanford weapons lab in eastern Washington can be pooled with TVA’s 29 power-producing dams and 6 reactors to generate enough wheeling power to supply emergency needs in 48 of the 50 states and the District of Columbia. But make no mistake. That ration is not enough for homes and businesses, which takes down the food supply chain, gas stations, television, commercial air, bus and rail travel, the internet, wireless telephone service, any ATMs not already empty, and anything resembling normal life for 300 million people. 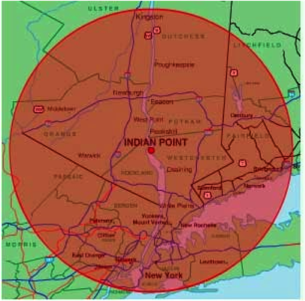 It merely prevents a glow-in-the-dark outcome for New York City and the 8% of the US population within the evacuation zone of Indian Point, which would be happier than the alternative. As of this month, March 2014, there are 435 operating nuclear power reactors, in 31 countries, and in 15 countries there are 72 more under construction. If agribusiness shuts down (no money and no fuel), there will be no industrial-scale spring plantings of wheat, beans and corn. Herds of cows, sheep and other domestic animals that lack pasture or stored feed will be slaughtered and their meat either traded for spare parts, whiskey or bullets, or composted. People who hope to turn lawns into gardens may discover it difficult to obtain seed. The rural ecovillagers and communitarians who have been pursuing a “lifeboat” strategy with permaculture designs and transition towns may fare somewhat better. They have better food and water security than most and for a while they could lend a helping hand to those less fortunate. Amongst ourselves, we might even begin to re-establish a homebrewed internet using ham modems on shortwave powered by solar energy. ... our towns look infinitely worse than the street-views of Ukraine’s population centers. Ours were built of glue and vinyl, with most of the work completed thirty years ago so that it’s all delaminating under a yellow-gray patina of auto emissions. Inside these miserable structures, American citizens with no prospects and no hope huddle around electric space heaters. They have no idea how they’re going to pay the bill for that come April. They already spent the money on tattoos and heroin. A century from now our numbers and hubris will have declined, and none of us will likely be around to see it, so, for most of us as individuals, half a century or more out is equivalent to near-term extinction. Our species will still be here. At this precious moment, our future is not engraved in stone. We may yet sponge away the writing. Still, a couple years’ supply of food, fertile seed, ham modem equipment and more solar cells is probably not a bad idea. The next crash will look nothing at all like 2008, but the Post-Petroleum Survival Guide and Cookbook: Recipes for Changing Times still holds its value. 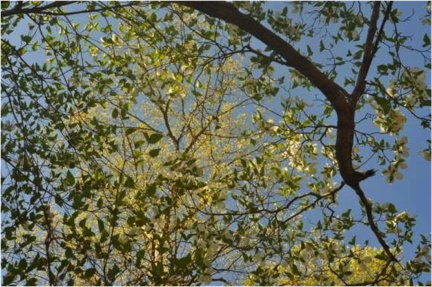 We are comforted by the arrival of longer, warmer days and our migratory friends, the birds and butterflies. This history, this season of change, is a pattern that abides. It always renews hope that maybe now, this year, things may begin to get a little better, or at least begin to sort out the truth from the fiction.